Scorn if you must, but I have a rule when I travel for work. That is that I don’t eat adventurous local foods until the business has been done. An annoying rule at the best of times, and positively burdensome when you’ve taken on the adventure of a food blog. But I’ve seen too many others fall foul of the impression that when they travel for work, they’re on one fine jolly, with no consequences. And then they’ve fallen sick, or they’ve emerged with hangovers, and proven to be remarkably poor value for whichever organisation paid for their services. Not me. The problem, of course, is that once the business has been done, then often there’s not much time left to make up for lost time. I am regularly in Buenos Aires these days - often twice a year - to give lectures on themes of businesses that make a difference to the world. Now, I’ve eaten at Argentinian Parrillas enough in the past that they don’t even count as exotic local food - and I’ve never had a problem, unless you count the time when, tired of the ubiquitous beef, I ordered chicken only to note with alarm the vivid pinkish hue the resulting meal exhibited. I decided not to risk that one. But on this most recent occasion, it was such a flying visit I decided I might as well stay in my own timezone. That meant waking up at 3am local time, being able to get five hours work in, fine-tuning bespoke websites or pushing out social media content for clients, before going on to lecture. Then late lunch would count as dinner, and off to bed at 7pm local time. That schedule isn’t going to get you much adventure in a city where nobody goes out much before 10pm and the restaurants don’t even open for evening meals before 8pm. But once my final lectures were delivered, there was one restaurant literally down the road that I knew I wanted to revisit - Gran Parrilla del Plata. I’d only been to it before in the evening, when it was crammed with customers, with waiters floating about the place in a frenzy of keeping-up. But this was late lunchtime - and it was the emptiest I’d ever seen it. No problem. I just needed to get my one fix of Argentine beef before my flight the next day. It might have been because there was a demonstration in Buenos Aires that day. Coaches were lined up along the Avenida Independencia, and large numbers of people with flags and banners were walking down the middle of the streets. There was the occasional sound of fireworks. It all seemed very good natured, but such demonstrations can turn and I’d noticed that quite a lot of places were closed and boarded up. Not always a good sign, for sure. I’d asked the woman who’d rented out the Air BnB I was staying in, and she’d said it was because of the growing poverty and economic tough times in Argentina. So even more likely to generate a certain amount of anger and passion, then. Still, the good people of Gran Parrilla del Plata were clearly made of sterner stuff than some of their commercial neighbours, and if they were up for it, so was I.
I felt tired, and although I would normally go for Ojo de Bife (rib-eye), I thought I would go instead for Medallon de Lomo - described in English as a medallion of tenderloin. Ha, medallion my foot. When it arrived - as usual - it was more like a paving slab than a medallion. 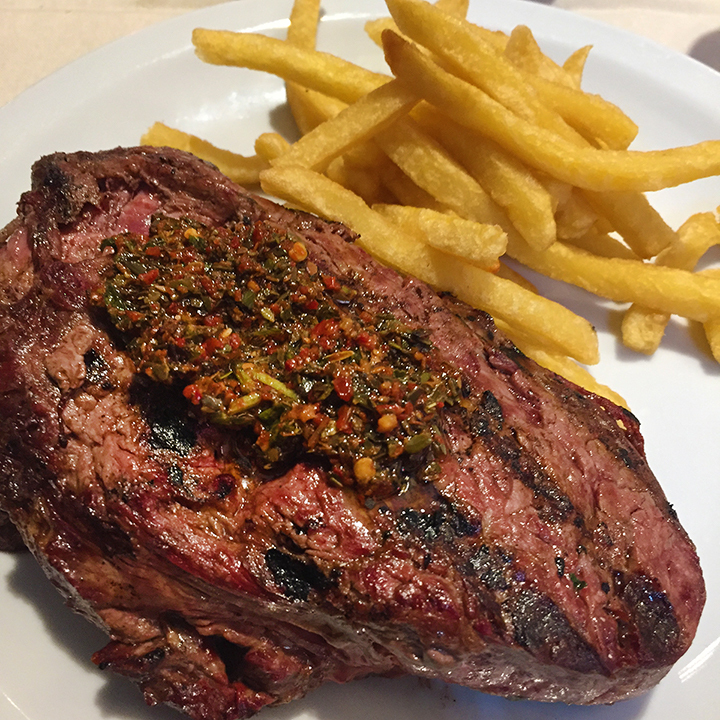 The first time I ever visited an Argentinian restaurant, I told friends it was not so much a steak, more like two cows stitched together. Tough economic times haven’t made any difference to the generosity of portion sizes. Gran Parrilla del Plata is a lovely old place. It is located in San Telmo, which is the oldest neighbourhood of Buenos Aires which can lunge from quaint and characterful to shabby and faintly unnerving within one or two streets. San Telmo is where, every Sunday, the big artisan market takes place where you can wander around for a whole afternoon taking in all the hundreds and hundreds of different stalls, eating local street food and watching the occasional demonstration of - naturally - the tango. The restaurant takes up the ground floor of an Art Nouveau building that used, appropriately enough, to house a butcher’s shop. It has a great charm and, each time I’ve been there, there has been at least one waiter who can speak pretty good English which is just as well, as however many times I’ve been to Argentina now, I’m still stuck at page 1 on the Learn Spanish book. Disgraceful, I know. If you’re only going to eat beef occasionally because of the higher environmental impact it has, it’s certainly worth saving yourself for some of the best grass-fed Argentine beef (although you have to ask - you can’t guarantee any longer that it won’t be feed-lot). And this time was no exception - cooked to perfection on a charcoal grill, smoky, tender, flavourful. Served with enough French Fries to sink a battleship and with some fantastic chimichurri sauce to go with it. And the half bottle of Norton Classico Malbec did its job very nicely as well. 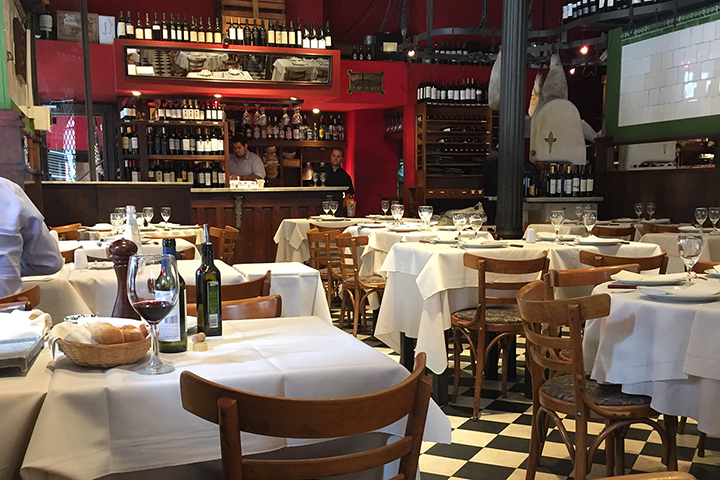 If you’re visiting Buenos Aires, there are all sorts of things you’ll want to do, but surely one of them will be to visit at least one restaurant like this. 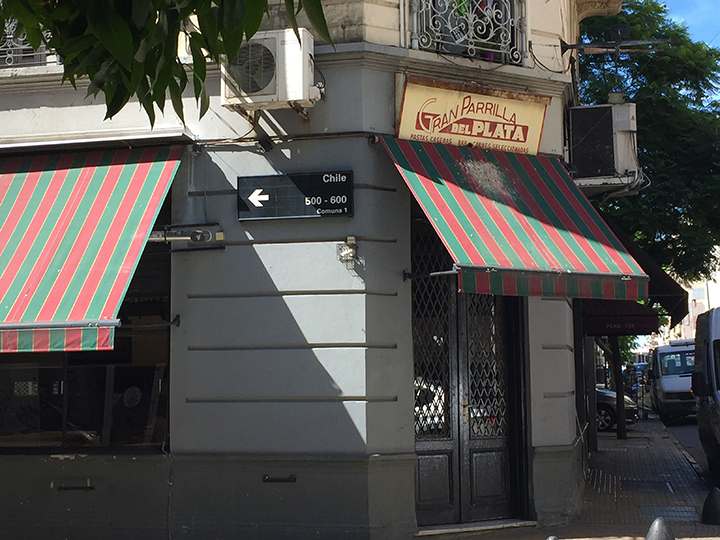 And if you’re in, or around San Telmo, you could do a lot worse than seek out Gran Parrilla del Plata.